Dark Horse Comics is cooking up something pretty sweet for die-hard BioShock fans. Launching next year in conjunction with BioShock Infinite, The Art of BioShock Infinite is, as the title suggests, an art book based on Irrational's upcoming shooter. The hardcover tome will offer fans a deeper look into the BioShock Infinite game world, with both concept art and production designs of the architecture and denizens of the flying city of Columbia. The focus of the book will be on the main characters, Booker, Elizabeth and the Songbird, but will also give readers insight into the development of the Heavy-Hitters, the Vigors, the people of Columbia, airships, the Sky-Hook and more. The Art of BioShock Infinite will also feature a forward written by BioShock Creative Director Ken Levine. Amazon lists the regular price of The Art of BioShock Infinite listed as $39.99, but currently has it up for $26.39. 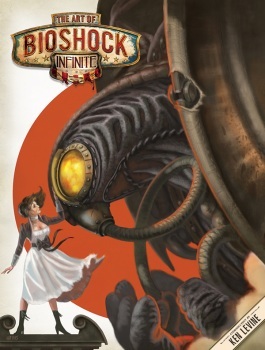 However, Amazon also lists a publication date of March 12, 2013, while Dark Horse says it will be on shelves on February 27, the day after BioShock Infinite launches. I think that's the date I'd put my money on.